Small antique Gaudy Welsh mug,nursery ware? Unusual colours - gaudy welsh with no orange. A lovely shape with gadroon top edge and foot. Rare Pearlware Gaudy Welsh Flow Blue jug / pitcher. with floral & vine decoration embossed with copper and twisted vine handle. Gaudy Welsh - Large Pitcher/Jug, c1825 attributed to John & Richard Riley - Pattern 793. This very early Gaudy Welsh Jug/Pitcher is attributed to John & Richard Riley of Burslem, Staffordshire from 1796 - 1828. Probably Glamorgan Pottery, Swansea. An early / mid 19th century, pottery jug, with hand painted Gaudy Welsh pattern. the lower body and associated stable star hairline. Impressed star mark to base. Antique English Pottery : A Gaudy Welsh hydra Jug C. early 19thC. An Antique Gaudy Welsh hexagonal hydra Jug with moulded decoration. ANTIQUE WELSH SWANSEA LUSTRE POTTERY JUG, FOR RESTORATION. VERY MUCH IN THE SWANSEA SHAPE. 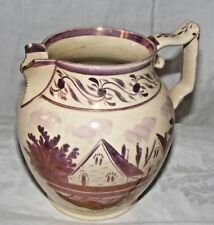 HAND PAINTED WELSH POTTERY LUSTRE JUG. CRAZING, SPOUT IS MISSING FOR RESTORATION. One Very Rare Gaudy Welsh Lidded Lion Finial Pot. One Gaudy Welsh Jug. The lidded dish pot is a puzzle as it could be a soap dish or a pen rest as it has indentations in the inner bowl area. Circa 1820.